The present rate and pace of federal reinvestment likely cannot ensure the reliability of the aging U.S. inland waterway system. Soy producers have served as leaders in calling attention to the need to examine alternative financing strategies to keep our navigation infrastructure sound and producers globally competitive and to explore innovative solutions in a timely fashion. Recently, The Horinko Group (THG), on behalf of the U.S. Soybean Export Council (USSEC) in collaboration with the Soy Transportation Coalition (STC), completed a report entitled, Proposed Public-Private Partnership Projects for U.S. Inland Waterways Infrastructure Financing, Operations, and Governance. The report, released earlier this week by STC (see press release), presents the case for an alternative financing strategy to encourage greater private participation in the operations, repair, and maintenance of the inland waterway system. THG’s effort examines the existing financing mechanisms, funding levels, operating practices, and governance arrangement and focuses on practical solutions offered by public-private partnerships (P3s). This analysis, funded by the National Soybean Checkoff program, could further inform efforts to shape a proposed Non-Federal Project Implementation Pilot Program put forth in both the House and Senate versions of the pending Water Resources Reform and Development Act (WRRDA) legislation. THG’s report provides a regional perspective focused on a critical segment of the inland waterway system. 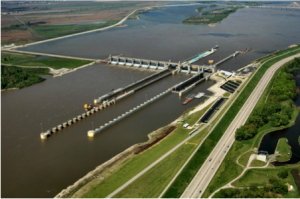 The contribution of locks on the lower Illinois River and the Upper Mississippi River to agricultural interests, including soybean growers-exporters, is well documented and central to the report’s findings and recommendations. THG briefed the results of its analysis to the Board of the STC on February 26, 2014 during the Commodity Classic in San Antonio, TX. In addition to presenting an overview of the report, THG recommended a path forward of next steps to formulate a strong regional pilot P3 project and recruit private investors and joint venture partners. The Horinko Group looks forward to assisting with advancing this important dialogue. For additional information on the report or next steps being considered, please contact Brendan McGinnis at bmcginnis@thehorinkogroup.org.